When summer weather beckons all to come outside and enjoy a meal with family and friends, there’s nothing quite so alluring as a charming garden patio set for dinner. With so many different styles, patterns and customized possibilities, concrete patios offer the variety you may be looking for. Concrete forms can be made to fit any size and shape, complimenting the layout of your yard and accenting the design of your home. No longer just a boring slab, concrete can now be brushed, stamped or dyed to add style and personality. 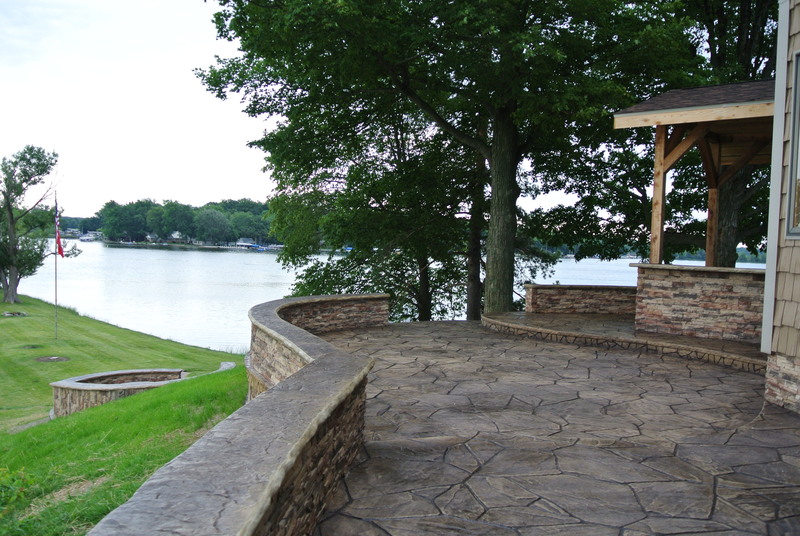 While it is one of the least expensive ways to create a patio, concrete can be make to look like its more expensive counterparts such natural stone, brick, slate or even wood, through concrete stamping. Concrete, especially raw concrete, is one of the most durable materials you can use. When properly poured and molded, concrete patios can last for years. If you have chosen to dye the concrete, it is best to have it sealed as well, to keep the color from fading. Adding an aggregate or non-slip surface to the concrete can also help improve safety in wet weather. Having an outdoor living space is also very appealing to prospective buyers and can improve your home’s value and allure. More and more homes are being designed to have smooth transitions from indoor to outdoor living spaces. With a smooth, flat area, you can enjoy barbeques and firepits with equal safety and enjoyment. Choosing a good contractor is essential when installing concrete patios. Professional can ensure that your investment will withstand the traffic and weather elements and they can add the beautiful finishes that will create a lasting gathering place for your home.